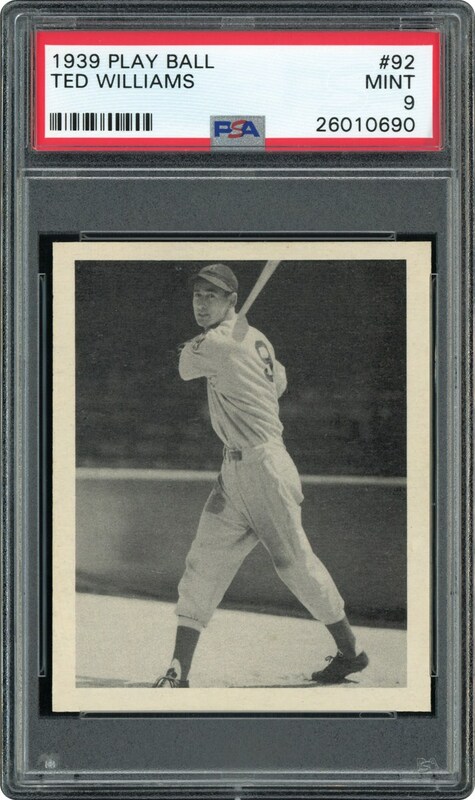 Lot # 1: 1939 Play Ball #92 Ted Williams Rookie Card (PSA Mint 9) - Only One Graded Higher! Rookie card mania continues to dominate the card hobby, with virtually all iconic Cooperstown inductees' inaugural cardboard heirlooms realizing earth-shattering pricing. One of those highly coveted rookie marvels is the illustrious 1939 Play Ball Ted Williams that is presented here in a remarkable PSA Mint 9 holder, one of only twelve specimens at this hallowed assessment with only a SOLE example graded higher! Indeed, the illustrious PSA card grading company has encapsulated over 1,000 Play Ball Ted Williams Rookie subjects with only one example able to achieve the pinnacle Gem Mint 10 mark. Of utmost significance is the fact that a "Mint 9" specimen virtually never surfaces, with the last publicly offered PSA 9 Ted Williams rookie card fetching nearly $240K more than two years ago! Its low population at the hallowed "9" assessment has severely limited its availability at public auction, with the two prior appearances being August 2013 and December 2010. Simply stated, three appearances of a Mint 9 Ted Williams 1939 Play Ball rookie in the past nine years does not even come close to accommodating the vast number of elite enthusiasts who crave to own this breathtaking cardboard marvel. No doubt, this world-class "Mint 9" offering truly resides as one of the hobby's most formidable and desirable rookie cards, with its illustrious stature synonymous with the "Splendid Splinter's" unparalleled hitting prowess. Regarding Ted Williams incredible legacy, it is not every time that we have the opportunity to fulfill our lifetime dream. For the great Boston Red Sox slugger Ted Williams, achieving his dream of "walking down the street with people passing me and saying there goes the greatest hitter who ever lived" did become a reality. Most baseball historians firmly agree that "Teddy Ballgame" is the greatest hitter of all-time, substantiated by his .344 lifetime average, 521 home runs, nearly 2,000 R.B.I. 's and the 2nd highest slugging percentage ever (behind Babe Ruth), with all of these amazing achievements compiled while Williams was missing five years in WWII and the Korean War as a fighter pilot! He is the last baseball player to hit .400 or better when he achieved a .406 average in his famous 1941 season, accomplishing all of these feats over four decades. Similar to Ted's sensational batting exploits are the breathtaking aesthetics of this "Mint 9" rookie card that has justifiably earned the hallowed and ultra-scarce PSA assessment. This museum worthy masterpiece provides a "splendid" black & white batting pose as Ted completes his mighty swing, revealing spine-tingling resolution and stellar contrast. Snow-white white borders frame the classic image that, atypically, reveals near-perfect centering, defying the off-center technical stigma commonly associated with this issue. An immaculate-like surface ends at razor-sharp edges and pinpoint corner tips, and the verso's bold black print registration and gray surface are virtually un-improvable. 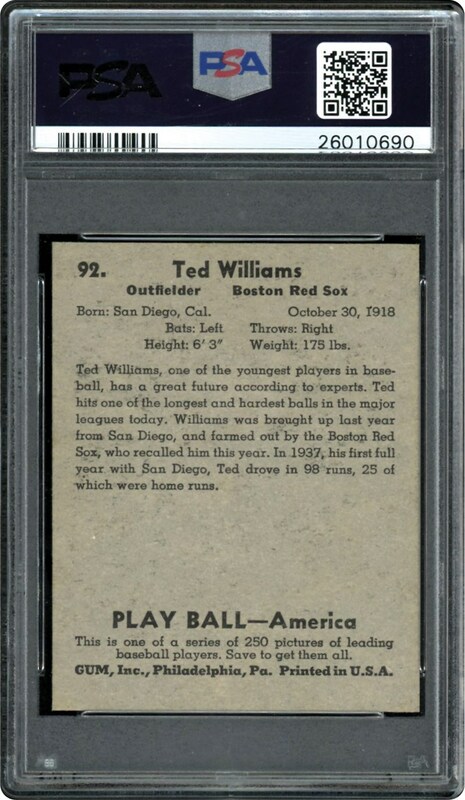 One of the finest looking Ted Williams 1939 Play Ball rookies extant, its current state literally defies logic, stubbornly defying "father time" over the past 80 years to retain all of its original factory issued attributes. A "perfect" testament to Ted Williams boundless legacy, it conjures of vivid memories of how this incredible hitter elevated himself to a pinnacle level at his gifted craft. Similar to Ruth and DiMaggio, Ted Williams will forever be categorized as an American hero, solidified by William's being the best at his particular skills, both in the batter's box and battling enemy fighter air craft in two separate wars. Little did people realize back in 1939 that when a young "kid" stepped to the plate (similar to the Williams image reflected on this card), they were witnessing the emergence of the greatest hitter in the history of our storied National Pastime, with none of his cardboard mementos more significant than his inaugural 1939 Play Ball "Mint 9" marvel that seldom surfaces for the taking. Simply stated, this grandeur offering stands right alongside the finest cardboard collectibles in the industry including the Baltimore News/M101 Ruths, T206 Ty Cobb back, T206 Plank, 1933 Goudey Lajoie, and 1951 Bowman/1952 Topps Mantles, with its irrefutable iconic stature worthy of an esteemed place in any world-class compilation!